The Elvitigala Mawatha, Colombo 8, is home to a host of major commercial spots in Sri Lanka. If something fails there, therefore, deserves national attention. The well-known lane, despite its reputation, has been compelled to undergo the poor upkeep of maintenance. This phenomenon has plagued the road stretched between the general cemetery roundabout and the Department of Motor Traffic. All lights on the stretch have been defective for over six months. This is a death trap for pedestrians and other road users after dark. Will the Colombo Mayor use her good offices to instruct the relevant authorities to attend to this immediately in order to avoid an unenviable fatality? The regular anti-dengue fogging of this stretch has come to a standstill. As a result, this area is now infested with mosquitoes. This would only mean that with the onset of the forthcoming monsoon, cases of dengue will reach epidemic proportions here. 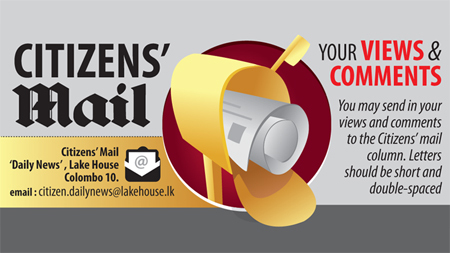 We earnestly urge the Colombo Mayor to consider this an urgent case.